It’s an interesting question. In our very mobile population, it is almost expected that people will move to different parts of the country or, living in a city with five military bases such as Colorado Springs, different parts of the world. When I ask, I’m usually expecting the answer to “where are you from” to be something other than Colorado Springs. So from my friend’s response, my blurting out that “I’m a native” must seem, what, a little prideful? Does it come across as creating difference – “you’re new, I’m a native”? — and therefore maybe a little arrogant? I have pondered why it is important to express, blurt out even, that I am a native of Colorado Springs. Perhaps it is out of nostalgia. I remember when … the north end was not even “The Old North End.” The north end of Colorado Springs was basically north of Uintah Street, or maybe even north of Fillmore. The north end ended where Nevada Avenue merges onto I-25. Rockrimmon was simply the site of the old Pikeview coal mine and, more when I was growing up, high school woodsies and keggers. Penrose Main on Cascade Avenue was simply Penrose. The 13-story red and white building was the only Penrose Hospital in town. And Penrose was a visible and meaningful landmark in the town. Until the Holly Sugar building was built in the early 1960’s, Penrose rose up out of the tree-lined streets of the north end like a beacon. One could always orient one’s self by finding where he was in relation to Penrose Hospital. And when it is your place of birth, it grounds one in familiarity, foundation, reassurance. Coupled with the fact that I was born there, Penrose was also where my mother was trained and as a nurse and then employed for some 40+ years. The Pikes Peak or Bust Rodeo breakfast was a small town event. So was the 4th of July gathering in Memorial Park. The population throughout the 1960’s was only around 90,000 residents. Today, the 4th of July event draws more people than that to the Park. I remember when the Manitou Incline actually had a train car that pulled people the mile up. Those were saner, simpler times. And Jones Park was a hiking and backpacking experience where you would not see another hiker (and mountain bikes were not even invented) for the entire weekend. Does it just come down to nostalgia? Maybe it is just due to the fact that I am getting older faster and reminiscing more often and more deeply. 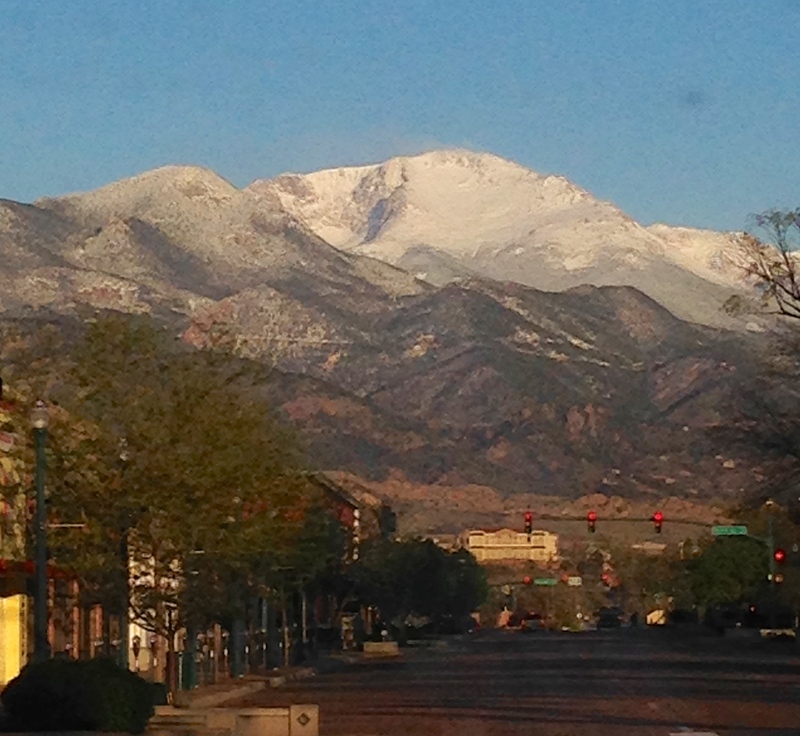 The old and familiar of Colorado Springs still serves as my anchor despite the changes. I love walking down Tejon Street despite the loss of Michelle’s ice cream, Lorig’s cowboy boots and hats, Hibbard’s pneumatic tubes where your payments zoomed out of sight and where the elevator was tended by an elevator man. I love the presence of the Fine Arts Center even though I do not take advantage of the richness of it as often as I should. Despite my own liberal leanings, I think NORAD is awesome, the Academy is beautiful, and Fort Carson (where my uncle worked) is pretty cool. But there is something about waking up with the sun-reddened granite of the Pikes Peak summit greeting you on fall mornings that lingers bone deep. (It is also knowing “Pikes Peak” has no possessive apostrophe and being OK with that despite being an English teacher.) It’s knowing the effect of the chinook winds, that today’s snow may be gone by sunset tomorrow. Or even later today. It’s knowing that despite living in the most conservative of all counties in Colorado, we weathered Proposition 2 twenty years ago. It means we can enjoy a rich arts community even if it feels tiny at times. It means despite our growth, we can enjoy nature experiences within our city limits and wilderness experiences within an hour’s drive. So, yeah, I blurt out that I am a Colorado Springs native. It’s a statement that says welcome to what I have known for many years, and it serves as the segue into the near-apology of “I know, things could be better here.” Maybe it’s a bit protective of a life that once was and is not the reality today. Maybe it is an invitation that says let’s continue to create a space together that has all the closeness of a small town but the richness that 400,000 people may bring. Over the last several months I have been thinking a lot about “regret” — both the concept in the abstract and two specific regrets I have somehow managed to tote along in my life for quite a while. There are two competing perspectives, it seems to me, about “regret.” One school of thought holds that you can’t escape having regrets; they’re part of our human make-up. When we look back on our lives at different points, we wonder “what if” or question a decision made along the way. Friends around me have said, “There’ll always be regrets. No escaping. It’s human.” I’m not a believer in “everybody does” or “it’s part of being human.” What’s the spiritual solution to the mental obsession of regret? The question that has been running around my head, then, for the past several months, is how do you get to that place of “We will not regret the past nor wish to shut the door on it”? Of course, the past is past and what is done is done. I get that. But just saying it doesn’t end the thinking or sometimes the downright obsession with the regret. In 1975 (yes it goes back to the summer I graduated from high school), I was denied admission to Colorado State University. My math scores were too low to be admitted into the College of Forestry and Natural Resources. CSU recommended that I attend Fort Lewis College in Durango, take my math and other general ed courses there, and then transfer to CSU. I decided in June of 1975, while working at the Colorado Outdoor School in Vail, not to pursue that path. Instead, I worked in a factory for a few weeks and then re-applied to CSU as an Undeclared Liberal Arts student. And I was accepted. I went for one semester and withdrew again. During the next 13 months, I worked the night shift at another factory. When we got off at midnight, I would go home (usually after a stop at the Tam-O-‘Shanter Pub on Garden of the Gods Road) and write for two hours or so. I’d write poems, short stories, one act plays usually based on my experiences in the factory and the people with whom I worked. Motivated by the desire to write, I decided to return to Colorado State as an English major. 33 years later, after some minor turns and some major changes (like getting sober 31 years ago), I have been committed to my career in education. It has fulfilled me and I would like to believe that I have made an impact in people’s lives over the past 28 years devoted to this honorable profession. So, where is the regret? As I write this, I see the beauty of my own life right now: the rich profession I have enjoyed for nearly 30 years; the opportunity to spend considerable time in the outdoors pursuing fly fishing (more than a hobby or pastime and closer to an obsession) AND with the person I love; the chance to write about that obsession, er…interest on a frequent basis. I have probably attempted to smother the sorrow of not pursuing the academic path offered by CSU’s College of Forestry and the sorrow of not pursuing more aggressively my own desire to write. Thoreau’s comment to “tend and cherish” is more how I try and live today. His admonition to not “smother your sorrow” is, for me, right on target. It has never worked for me to try and stifle, smother, or deny my human emotions. Why do that with feelings of regret that surface? The question becomes: what to do with them? “Tend and cherish” until it becomes a “separate and integral interest” sounds like detaching (with love) from the regret while also realizing its essence. For whatever reasons that a profession in Forestry or a more active engagement in writing did not materialize (addictions, then lack of focus, then lack of resolve), the “integral interest” is still with me. Who we are and what we know at a given point in our life form the foundation for our decisions made at that point. I think that what remains, the integral interest, will need to take a new form than they may have taken 30 years ago. The road down the College of Forestry & Natural Resources and the road down total immersion in writing are still seen from my rear-view mirror. Any regrets that have traveled with me, stored away in the trunk of the car, can also allow me to “live afresh” on this road I have traveled. They don’t have to be smothered but, instead, freed to bring energy into this day. I think their essence will be part of my recovery as the two converge to meet on the banks of a river. My brother retired a few years ago from being a cop. He served the Colorado Springs community, his hometown, for 30 years. I learned a little about police work watching my brother. He worked the bar detail for awhile checking places like The Wagon Wheel on (what was then) the east part of town and then he’d drive over to The Cotton Club in downtown Colorado Springs. Bar owners liked him. He was fair with them. Wanted to protect their business, their livelihood. He worked his way up through the ranks becoming a sergeant and then working undercover on drug detail. He once described police work as hours of routine and monotony interrupted by very intense, life or death, adrenaline-pumping action. Arriving on the scene of a bar fight, or busting through a door with a suspected meth dealer, armed, on the other side gets your attention. As a cop, his interactions with the public were almost always in high stress, unpredictable situations. You don’t roll up on the scene where humanity is showcasing its finest behavior. You get a tainted view of humanity, I suspect, because you constantly view its underbelly. It’s the nature of the job. And it takes its toll. My brother was a good cop. And by that, I mean he was skilled at what he did; he was respected by his peers and by cops who served under him in his sergeant command. And he was a good cop, an ethical one. He lives by a strong moral compass. And this writing is not some unexamined, younger-brother-admiration of his older brother. We argue. We don’t see eye-to-eye. My brother, 15 years older, is a product of the 1950’s. He is on the conservative end of the spectrum. My liberal leanings are fodder for an argument in which he always seems ready and willing to engage. I both admire his conviction to his beliefs and wince sometimes at his unwavering adherence to them. I suppose it is true with all of us — “conviction to” borders on inflexibility. ”Seek to understand” sometimes doesn’t exist. I have thought a lot about him over the last several months. I have thought a lot about cops. I have thought a lot about community. About humanity. I have thought a lot about Eric Garner and Michael Brown. I don’t understand … I’ll just leave it at that. I don’t understand. How they both died, unarmed, by the hands of cops for apparently pretty minor crimes. How their resistance to whatever the cops were asking them to do escalated so quickly that they were dead within minutes of the interaction. And I have thought about Tamir Rice who, at 12 years old, was shot within seconds of cops arriving at the park where Rice was brandishing an Airsoft pellet gun. Or playing with. His naiveté and kid-innocence tiptoed up to adult realities he could not really know. Three black males — 12, 18, 43 — dead on the street. And I have thought about cops being shot at lunch, like the two in Las Vegas over the summer, and, more recently, the two in their cruiser on a Brooklyn street. I don’t understand. Our view is skewed by the color of our fellow man’s skin or the hue of his uniform. Are we all becoming profilers — racial, ethnic, religious, gender, occupation? Our reactions toward and interactions with others are based on perceived and preconceived roles rather than relationships. Perception is reality. The cop in blue or the black man in a hoodie. The cop. The black man. Threat. We see an icon, an image, a caricature. We have lost touch with our humanity. We become transfixed with seeing images of a black kid hugging a white cop not only because of racial implications in the photo, but maybe because of the touch. Arms around each other. Body to body. The humanness. When are we ever this close to another human being, particularly those we may see as a threat? The creation of more dialogue to build understanding and relationship won’t guarantee a fix. But the absence of dialogue, the lack of effort to build understanding, surely guarantees no progress. The human voice touches. Art touches. Literature touches. Back in the early 1990’s, I was teaching a night course at the University of Colorado at Colorado Springs. After the 7:15 class, I was heading to my car along a dimly lit sidewalk that ran along the side of the library building parallel to the parking lot. A young woman, maybe around 20 years old or so, was walking in the opposite direction. As we approached each other, her eyes quickly darted up to meet mine, then she looked straight forward. Her body seemed to tense up, she clutched her books and bag closer to her. I wanted to tell her nothing to fear here. But of course she walked in a fear in that dark night that I did not experience. I’m a white, straight male. Because of those biologically determined facts, I have been privileged in social, economic, and professional ways. Privileged. Coming to a level of consciousness of my privilege was a process for me. It was an awakening rather than an epiphany. As with other awakenings, it was in fits and starts, not a steady progression from unconsciousness to consciousness. Don’t most awakenings — spiritual, ethical, moral — happen that way? How many of us have a “burning bush” experience? In my late adolescence and early adulthood, I was too caught up in protecting my own emotional security and physical survival to be aware of “privilege.” After my father left when I was 12, my mother, a Registered Nurse at a local hospital, and I moved from our large Victorian house to a two-bedroom apartment. Three years later, due to the economic challenges from being a single mother, we moved to a basement apartment. Six months later, we moved again. It’s difficult to be conscious of privilege when you’re struggling to hold it together. Perhaps, too, it was because of my last name which isn’t very American sounding. I had to pronounce it repeatedly for teachers; I had to spell it out; I had to explain its nationality. It may be difficult to be aware of privilege when, as an adolescent, you are shaping and explaining your very identity. But I do not offer that as an excuse or a justification for not being conscious of my own privilege. I offer that to suggest that coming to consciousness is, more often than not, a process of accumulated experience, a dialogue with others, and an education which may come in a variety of forms. In fact, William G. Perry’s work on intellectual and ethical development would support the idea that as people grow and mature, they pass through clear stages of moral, intellectual and emotional development. On my journey to understand the privilege of my white maleness, I had to experience some degrees of “otherness.” Of course, that in itself is quite a challenge. In my early adulthood, though, I deliberately created opportunities to be in the minority for even the briefest of times. I have been the only white male in a college course on Afro-American History. I have been the only male in a course on Women’s Literature and Literary Criticism. I have been one of a handful of straight males at gay and lesbian events, the most remarkable being a poetry reading and subsequent discussion with feminist and lesbian poet, Adrienne Rich. I have been the only white male in a bar, the Shadowglen Lounge, in the mid-1970s. In the late 1990’s and early 2000’s, I was engaged in a handful of conversations both online and face-to-face about privilege. My contributions in those conversations were often shot-down. I was misinterpreted as arguing that white males are victims. I was accused of not taking responsibility for my own actions. I was vehemently ridiculed for not acknowledging the benefits I have from my privileged position in society. So I stopped talking and buried my interest in being in the conversation. I am not a victim, certainly, of my white maleness, but I am a victim of a society that tolerates, fosters, and gains from a social, political, and economic system that privileges one over another. Again, Friere, says “[The oppressor] cannot see that, in the egoistic pursuit of having as a possessing class, they suffocate in their own possessions and no longer are; they merely have.” I inherited, was born into, a system that I can only work to change. So my silence is not healthy for me individually. The silence of any group is not healthy for us, societally, and in a larger context. I cannot undo my white male straightness. I’m “stuck” with what I was biologically dealt. No biological solution, however, exists for a social, political, racial, and economic problem. The solution isn’t found in silencing any group. Yes, I need to listen more to hear. I need to reflect more than respond or react. Dialogue and conversation means that we are going to say the wrong thing. It means we are going to be misunderstood. I read somewhere recently that white people cannot understand or talk about race and racism. I disagree. Perhaps for too long we have had a monologue or disingenuous dialogue. We all need to move toward gaining a new understanding. How will new knowledge be gained if dialogue is denied? The risk of any missteps in getting to a new and deeper level of understanding has to be taken, though, because the consequences of no dialogue, no conversation, are too great. Those consequences get people shot, communities burned, countries fractured. I’ve been thinking about risk-taking a lot lately. I’m not much of a risk-taker, it turns out, despite the fact that I am the youngest child in my family and according to some infographic I saw on Facebook (second only to Wikipedia for credible information), the last born child is a risk-taker just naturally. But I had been thinking about this even before that contradictory chart appeared on my newsfeed the other day. Risk-taking — taking a chance, a gamble — means working without a net. Rock-climbing without a belay. It means the mutual fund is made up more with your Aggressive Growth Portfolio instead of Money Market. But if you can’t fail or there is protection if you do, what sort of risk is that. It’s rock climbing by walking on an undulating forest-service road. It’s tight-rope walking on sidewalk cracks. Low-risk is low-pay off. Low-risk is low consequences. Not much of an adrenaline rush if you’re tightroping the curb. Adulthood, parenthood, responsibilities and bills to be paid seem to sandpaper off the urge (or is it the opportunity) for risk-taking. You can’t take unwilling — or even unknowing — hostages with you on that tightrope. You can’t let them piggy back as you scale that rock face. Can you? So I look around at my comfortable home, my loved ones who share it, and the respectable professional life I have pursued. It’s a nice life. Fulfilling. Pretty safe. It won’t win any gold medal at the X-Games. No Extreme sport, this life. But just once I’d like to climb without a belay. It has been a long time since I have sat “Indian style.” Do we grow out of it or just not find ourselves sitting on the floor so much after a certain age? Or maybe it is a flexibility thing. Getting down there isn’t the issue. Unfolding is. I doubt that it’s even called “Indian style” anymore. I’ll have to ask some of my friends who are elementary school teachers. I forgot how much I enjoy many of the songs by the Cowboy Junkies. My sister, Deb, turned me on to the Cowboy Junkies. She also, back in 1977, introduced me to the album The Outlaws (Willie Nelson, Waylon Jennings, Jessi Colter, and Tompall Glaser). Oh, and Linda Ronstadt, Emmylou, and John Prine. Damn. 34 years ago. Or 37. I can’t do math and treadmill at the same time. I wonder what Jannetta would like for her half-birthday? That’s coming up in a few weeks. She has done a great job as summer school principal after a demanding school year as Master Teacher. She’s one of the best in the education world at what she does. She’s one of the best people that I know. And she’s my best friend. What kind of a writer do I want to be? what kind of genre do I explore next? Tackle shorter pieces. Maybe a focus on prose poetry. Love the prose poem. Maybe essay writing. Creative nonfiction. Greenback Cutthroats. Skin. The Old Bon Pharmacy and cherry cokes! Being male. I feel closer to God when I am in the mountains. Wow, that’s a little trite: “I found God in the mountains.” But it’s true. I think my conception of God was formed in the spring of 1972 during the Outward Bound trip in the Lost Creek Wilderness Area. During the solo portion. I wish I had that journal. “If you’re gonna worry, don’t pray. If you’re gonna pray, don’t worry.” I’m worrying a lot less these days. Maybe a lot less than ever before. Is this a normal respiratory rate for my age, weight and amount of exertion? This isn’t “shortness of breath,” is it? I didn’t consult a physician before beginning my exercise routine. Homeownership isn’t all it’s cracked up to be. Well, it is a nice thing. A lot of maintenance. Hell ya. Being an adult isn’t all it’s cracked up to be, either. Fatherhood is a pretty cool gig. Jess is a free-spirit of a daughter. She is growing growing growing in so many ways. Her fiancé is a good dude, too. I’m a late bloomer. I discover things later than some. I think I’m good with that — but I wish I would have discovered fly fishing earlier in my life. Then again, things happen when they happen.